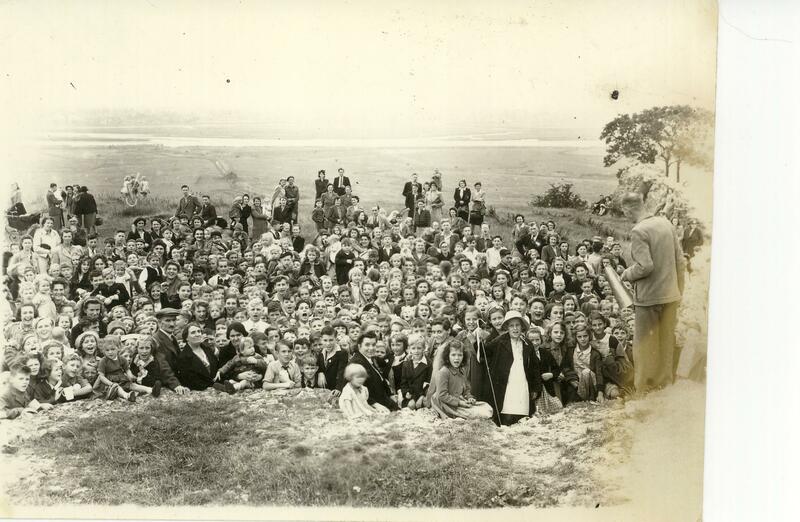 We think this is a gathering for some purpose of Hadleigh Junior School at Hadleigh Castle. Mr. Tutt (?) is addressing everyone with a megaphone. Is he leading the cheers? One or two pupils are in fancy dress. Who are the adults present? Can anyone supply any further information? I’ve been researching the Smith family from Hadleigh for many years and I’m wondering if we are related in some way. My family are linked to the shoemaker William Smith? I am also 99% sure that John Smith’s two sisters are on the left hand side of the photo. My mother, Brenda Potter nee Smith would have been 13 years of age and she is holding my Aunty Kathleen who would have been approximately 4 years old. Brenda, John and Kathleen lived in Ash Road, Hadleigh with their parents Ernest and Hilda Smith. Ernest had siblings that lived just around the corner in Beech Road and they also had children of around the same age so there must be other Smith Family children in the photo as well. Is that Terry Barclay in disguise in front with his shepherd’s crook?Just wondering. Intrigued by the barn across the ditch in the background to the left. Looks like a depression at the side of it. Would that perhaps have been large enough once to hold a mill pond? I probably know most of the kids in this photograph, but I didn’t join Hadleigh Primary until late in 1946 when we moved from Benfleet to Hadleigh. I knew Maureen Theobald well, I wonder if she remembers me? I had a few canings from Mr.Tutt, due to my propensity for mischieviousness. I’ve calmed down a little now I’m 78! I am 99% sure that the lad right next to Mr Tutt’s left leg is my father, John Smith, he would have been 10 years old when this was taken…what a find! A Red Letter day at the Archive this week. Maureen Hume (nee Theobald), a delightful Hadleigh resident allegedly approaching her mid-seventies popped by our Office and regaled everyone with wonderful tales of Hadleigh of yore. She had brought her print of this Hadleigh Castle gathering and was able to cast some light on it. She recollected that it was a Hadleigh School celebration of either VE Day or VJ Day (May or August 1945). Maureen confirmed that Megaphone Man was indeed the venerable Mr Tutt. Bo Peep was Pam Rees and the girl behind the shepherd’s crook is Maureen herself! Working leftwards is sister Brenda Theobald (sitting at the front), with Mrs Jopson behind her. Young Arthur Jopson is next and then the lady in the dark coat, facing right, is Mrs Theobald, with her little Dorothy by her side. When I remarked that one of the small oaks (on the right) is still there, Maureen winked that a lot of courting had gone on under that tree. It’s always been one of my favourites too, and I’ve painted it maybe half a dozen times. Thanks, Maureen. Do write it all up – its wonderful, heart-warming stuff.